While on a summer internship in Europe, a young doctoral student falls in love with the professor’s son. 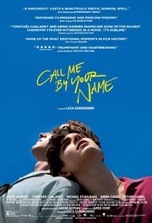 Based on the novel by Andre Aciman, Call Me by Your Name is a coming-of-age gay romance story set in Lombardy, Italy in 1983. The cinematography is gorgeous and is, along with the performances, the highlight of the movie. The downside here is a slowly paced film that has no antagonist, no major obstacles to overcome, no MacGuffin or overarching goal. The story meanders from one scene to another without really building tension, except for sexual tension between Oliver (Armie Hammer) and Elio Perlman (Timothee Chalamet). The only plot device that gives the film any urgency is the time constraint imposed on it from the beginning—Oliver’s internship is only for six weeks. The monologue at the end of the film, delivered with measured sagacity by Michael Stuhlbarg, brings the story into focus—if the movie has any meaning, it can be found in this brief heart-to-heart sequence between father and son. In the end, this is an art film in the purest sense. Its unconventional love story and controversial peach sequence will be the only things most people will remember about this film. And in case anyone cares, I prefer to be called by my own name. Thank you very much! Directing- Luca Guadagnino makes the most of limited sets and locations and elicits fine performances from his cast. Acting- The performances here are subtle and naturalistic. Chalamet’s brooding melancholy is a perfect counterpoint to Hammer’s existential insouciance. Stuhlbarg is the glue that holds the whole company together; his character serves as supportive father and inspiring mentor to the two leads. Story- A fine script by James Ivory, based on Aciman’s book of the same name. Characters are finely drawn and the subtle subtext that reveals the inner motivations and desires of those characters is what sustains viewer interest in a story that has no real action or conflict. Cinematography- Rather than employing aerial establishing shots of the Italian countryside, Sayombhu Mukdeeprom keeps everything close and intimate. The lens is kept tight on the performers, placing the burden on the cast to tell the story rather than on sweeping visuals, which, most likely, was dictated by the budget. The footage of the village captures its inherent European charm, and the interior shots of the house and exteriors of the backyard tether our thoughts and emotions to that one locale…like Oliver, we’re also sad to leave the house when he heads back to the States. Music- The score is an eclectic collection of songs by various artists. The soundtrack also includes originals by Sufjan Stevens, who seems to whisper his songs rather than sing them. “Mystery of Love” is highly evocative and perfectly captures the film’s bittersweet ending. Production Values- An indie film that, fortunately, doesn’t feel cash-strapped. Movie Magic- Depends on your preference of gender, genre and subject matter. Call Me doesn’t set the world on fire, but is a well made slice-of-life tale that’s festooned with beautiful locations and mesmerizing performances. However, its inclusion in the Best Picture category seems political since there are many other worthy films to consider this year, such as: Molly’s Game, The Florida Project, The Disaster Artist, Last Flag Flying and I, Tonya.